The Blake Theatre01600 719401work TheatreWe are a theatre that is at both the heart of the town and community of Monmouth. We play host to live drama, music, dance as well as renowned speakers. We also screen live broadcasts from the National Theatre, Met Opera in New York, Royal Shakespeare Company and Royal Opera House all on the biggest screen in Monmouth. 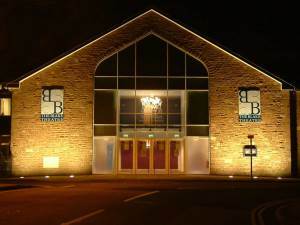 The Blake Theatre opened its doors in 2004. When Monmouth School refurbished its original building we decided we should share the theatre with you, our local community. So we have a part time team who are here to help you. Not only do we aim to provide an interesting range of shows, we are also available to hire for those groups seeking a professional venue for their production. You can book online, and stay up to date through Facebook, or our newsletter. We are a theatre that is at both the heart of the town and community of Monmouth. We play host to live drama, music, dance as well as renowned speakers. We also screen live broadcasts from the National Theatre, Met Opera in New York, Royal Shakespeare Company and Royal Opera House all on the biggest screen in Monmouth. You can leave a message on our answer service and we’ll contact you or call us during opening hours. Box Office is open 12pm-2pm Monday to Friday, and 10:30am-12:30pm on Saturday during term time.